Background: Intracranial hemorrhage is characterized by the blood vessel rupture and subsequent hematoma expansion. It is the least treatable stroke subtype, resulting in higher morbidity and mortality per incidence than ischemic stroke. Recent studies have observed lower than normal levels of plasma fibrinogen in patients of intracerebral hemorrhage. Furthermore, in other cases of severe hemorrhage, plasma fibrinogen levels have been identified as an indicator of prognosis. Current clinical management of cerebral hemorrhage includes adjunctive therapies and possible surgical evacuation. However, a possible therapeutic target for intracranial hemorrhage is fibrinogen. During intracranial hemorrhage with hematoma expansion, fibrinogen levels are rapidly depleted and thus are in need of replacement. 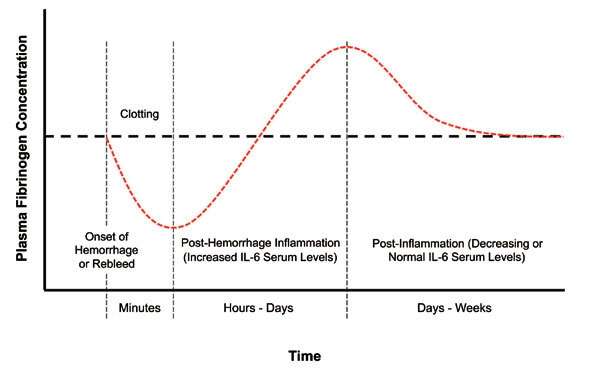 Maintaining high levels of fibrinogen can promote rapid clotting and reduction of hematoma expansion. Objectives: Within this review, we examine the role of fibrinogen in intracranial hemorrhage and evaluate the use of fibrinogen replacement therapies for maintaining normal levels of this key hemostatic protein. The pros and cons are discussed and an opinion of the most appropriate fibrinogen replacement therapy for intracranial hemorrhage is made. Conclusion: It is concluded that fibrinogen concentrate seems to be the most suitable therapy for elevating plasma fibrinogen for the treatment of intracranial hemorrhage with hematoma expansion. Fibrinogen, fibrinogen concentrate, fibrinogen cryoprecipitate, intracerebral hemorrhage, subarachnoid hemorrhage, germinal matrix hemorrhage.